The Blue Marlin is the ultimate challenge in big game fishing! They have been said to reach speeds upto 65 miles an hour! Kona holds the official all tackle world record at 1,376 pounds! Kona boats also hold the men's 30 & 50 pound line class world records, as weell as the womens 30 & 80 pound line class world records! Kona is the only place in the world where a Blue Marlin can be caught any day of the year! Kona has also produced more Blue Marlin over 1,000 pounds than any other fishing destination in the world! their has been alot hooked over 1,500 pounds but never landed, either broke line or pulled hook after hours in battle. Caught occasionally off the Kona coast, normally inj the winter months & April & May! They grow to approximately the same size as the Blue Marlin. The world record is 1560 pounds! 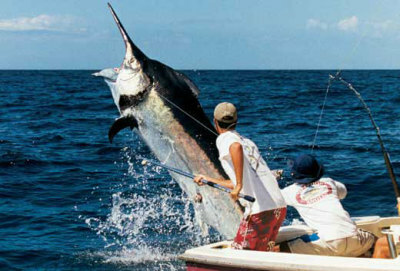 Kona is the only place in the world where both Blue & Black Marlin over 1,ooo pounds have been caught by sportfishermen! Caught more often in same time frame as Striped Marlin & at times all year around! Anglers trying to catch every spieces of Billfish generally end up here try to complete the slam! Virtually all the light tackle & fly fishing world records for Spearfish have been caught off the Kona Coast! 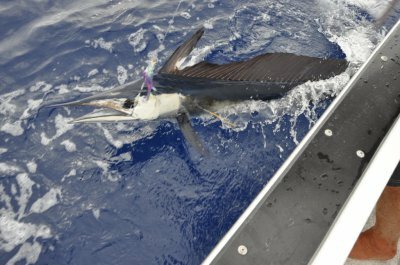 The average weight of Spearfish off Kona is 30 pounds! Also if looking to mount a fish these are not too huge & less expenesive & you don't have to kill the fish to mount it!